and valleys in my life. No one’s life is a complete joyride. We may be cruising along on smooth asphalt for a few days or even a month, but eventually even the most peaceful of life’s journeys encounters a pothole. Unfortunately, our highways also contain more severe road hazards, ones often resulting in personal loss, which can sometimes cause us to spin out of control and leave us stalled for a time in the middle of nowhere. In this first collection of his poetry, the author chronicles a time when he was stranded by his own road’s difficulties in a place of madness, depression, and unrequited love. Kloschinsky’s musings reflect a soul in turmoil, a mind and heart that cry out first against his mental illness and what it does both to him and those who love him. A trained physician, he suddenly finds himself the patient forced to endure the probing of psychologists and hypodermic needles. Depression follows, and poems with titles such as “Despair,” “Useless,” and “Suicide” reflect the poet’s mood during that period. But the theme that the author revisits most often and which pervades the entire last half of the book deals with the bitter loss of love. 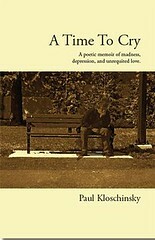 Although obviously well-educated and familiar enough with classical literature to include the occasional reference or allusion to a poet or a specific literary subject, Kloschinsky’s own verse is unpretentious and uniquely his own. While thematically reminiscent of the works of both Rod McKuen and Sylvia Plath, his poetry’s relation to theirs is due mainly to a similar life’s journey. As painful as his subject matter may be, the author’s emotional transparency and competence in his craft make his poetry a pleasure to read.